The Phoenix offers a flexible layout that is bold, vibrant, and modern. A stunning full-width banner tops the design, followed by strong call to action buttons certain to draw attention. Neighborhoods can be prominently featured on the homepage, offering a perfect opportunity to display your local photos while linking to your hyperlocal content. Choosing this theme will ensure you have an elegant, new look that is fully flexible to reflect YOUR branding and custom requests. Our semi-custom sites are always responsive, they not only function well at smaller sizes, but they look great too! Don’t make your leads suffer as they try to zoom in/out on their phones browser and struggle to click listings – get a responsive design today and catch up with your competition! A fully responsive IDX offers a sleek, intuitive search with backend enhancements for Agents and Brokers to manage and convert leads. Our WordPress real estate add-ons (a $900 value) allow agents to more easily add and manage their content, such as featured listings, featured neighborhoods, testimonials, agent pages, creating custom niche searches, and more. The flexibility of the site means additional plugins can be added on top of the licensed premium plugins we’ll include (and cover the renewal fees for). The Yoast SEO series, Gravity Forms, MapPress Premium, and Revolution Slider are just a few of the plugins included with The Phoenix theme. A key component of any real estate site is the IDX. With twenty years of IDX experience behind us, and multiple solutions to choose from, we can recommend an IDX solution that will best meet your needs. A fully responsive integration ensures the IDX will work perfectly on all devices, and all listings and IDX pages are indexable for SEO. IDX can be more than just a search on your site – with automated Market Reports as an option, you will beat Zillow with the latest sold data your clients seek. A number of lead capture tools will ensure leads have every opportunity to connect with real estate Agents and Brokers. Worried you will be left hanging when it comes to learning how to use your new site? Fret no more. Training is included with the site setup, we offer weekly live webinar courses and one on one training for our WordPress add-ons. Don’t know how to do something? No problem, just give us a call! It’s important to maintain your site after it’s live. We have several WordPress Care Plans to choose from so you can focus on real estate while we update and optimize your site for you. When it comes to our WordPress real estate websites we think of everything so you don’t have to. Give us a call or send us an email and we’ll setup a time to go over your goals and make a recommendation. 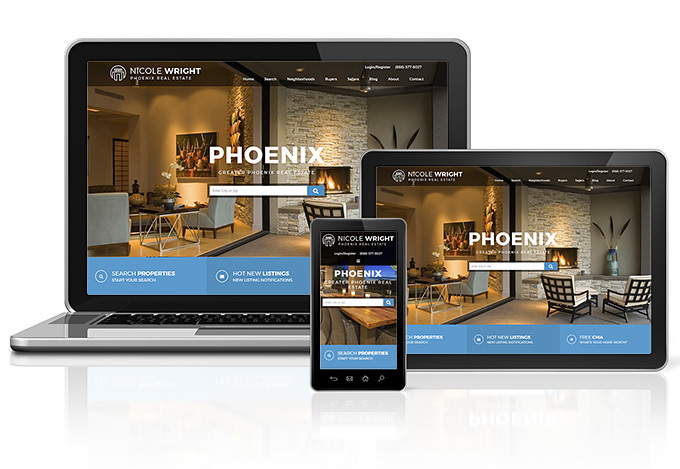 The Phoenix may be our newest WordPress theme, but we have several options on offer to choose from that can meet the needs of single-agents, brokers, and agent teams alike. Put our twenty years of real estate web design and development to work for you! Learn more about our real estate website services and contact us now to get started. Y’all do great work and provide great customer service! I am very happy with the site you created for me! Thank you Jonathan for the great feedback and we look forward to long partnership together. You have done an excellent job at populating your site with valuable maps, area details and hot links that your visitors seek. Well done!